P.M.B 250, Ede, Osun State, Nigeria. Due to the rapid exhaustion of fossil fuel based energy sources which is continuously increasing in cost, there has been a significant shift of focus towards renewable technologies for many decades. 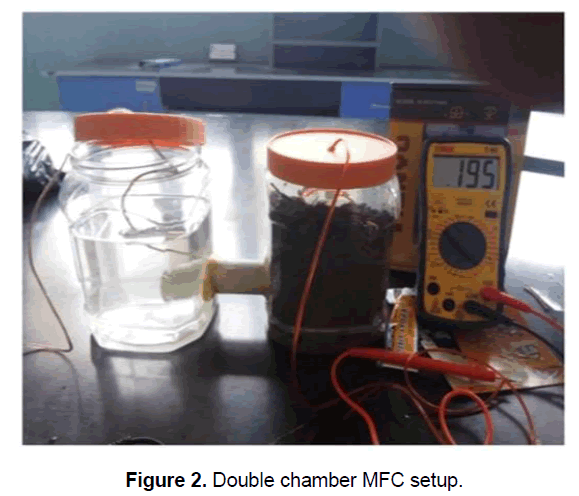 Ability to generated power using double chamber microbial fuel cell of mud sediments from River Ogbese at various depths was investigated for 12 days. The depths were surface water, depth 0 cm, depth 50 cm, depth 100 cm, and depth 150 cm. Microbial population and identification were determined using standard microbiological techniques and physiochemical parameters of the sediments were also determined. Current, voltage and resistance were determined using a multimeter and readings were calculated for power and current density. Microbial population was more abundant at the upper depths than the lower depths of the sediments, bacterial population of the sediments ranged from 0.4 10 -6 to 2.3 10-5 (cfu/ml) and the fungal population ranged from 0.2 10-5 to 0.7 10-5 (sfu/ml). Fungi growth was not found at depth 100 cm and 150 cm. The observed readings ranged from 0.02 to 2.17 (mA), 27 to 800 (V), 0.0 to 0.24 (W), 18 to 4357 (Amps/m2) and 0.097 to 9.76 (Ω) respectively for current, voltage, power, current densities readings and resistance. Physiological analysis reveal that the various depths of the mud sediments have low pH, low organic carbon, low ionization potential, high conductivity, and high salinity. The ability for all the river sediments depth to generate power was established with high resistivity. Many research and technological advancements have been made in the area of renewable energy sources and technology. This is due to the rapid exhaustion of the fossil fuel based energy sources which continuously increase in cost i.e. oil. On top of its unsustainability and high-cost, it is also a major cause of Greenhouse Gas emissions (GHG) in the atmosphere which has significant environmental impacts. There has been a significant shift of focus towards renewable technologies for many decades . Another potential area of renewable energy source which has resurfaced in recent times as modern technology begins to accommodate and to explore its possibilities; is the generation of power using bacteria. Microbial Fuel Cells (MFCs) facilitate this process and have gained a lot of attention recently as a mode of converting organic matter into electricity . It takes advantage of the sheer amount of microorganisms breaking down substrates found in places such as wastewater, sludge, sediments under the sea and any other places where bacteria growth is abundant. This concept of utilizing microbes as catalysts in fuel cells was explored as far back as the early 1970s. “However, it is only recently that microbial fuel cells with an enhanced power output have been developed providing possible opportunities for practical applications . MFCs have many potential applications, such as electricity generation, bio-hydrogen production, wastewater treatment and biosensor [4-6]. 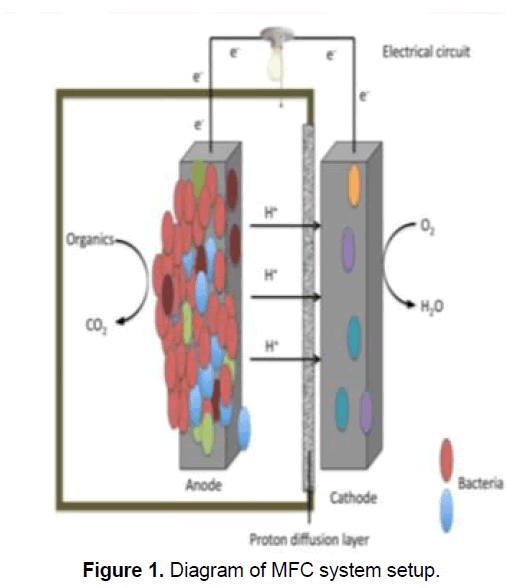 Microbial fuel cells (MFCs) are electrochemical devices that use the metabolic activity of microorganisms to oxidize fuels, generating current by direct or mediated electron transfer to electrodes [3,7]. The device comprises an anode chamber, a cathode chamber, electrodes, proton exchange membrane, and an external circuit. The MFC convert a biodegradable substrate directly into electricity . The anode holds the bacteria and the organic material in an anaerobic environment. The cathode holds a conductive saltwater solution in a double chamber type MFC or air if it’s the single chamber. The bacteria generate protons and electrons as the organic substrate is being converted into energy. This energy is used and stored by the microbes for growth. The electrons are transferred directly to the anode electrode (in a mediator-less set-up) and to the cathode electrode via copper wire or a conductive material. Protons pass through the ion exchange membrane to the cathode chamber to produce water as a result of the reduction process which is in terms of hydrogen transfer . Not all bacteria species are able to transfer electrons directly; therefore the use of artificial chemicals such as “thionine, humic acid, neutral red, methyl blue, and methyl viologen” is required. These are called redox mediators. According to Logan BE , the bacteria grow in the anode, oxidizing matter and releasing electrons as they break down the substrate. Some bacteria require exoelectrogenic biofilms in order to effectively transfer the electrons to the electron acceptor whereas some transfer electrons directly without the need of a mediator. The cathode is supplied with air or another inoculum to provide dissolved oxygen for the reaction of electrons via an external circuit, protons and oxygen at the cathode, completing the circuit and producing power . The major advantages of MFCs over hydrogen fuel cells, however, the power production by MFCs is currently limited mainly due to either high internal resistance or efficiency of the cathodic reaction, and feasibility of scale-up of MFCs is restricted by the high cost of membranes. With the appropriate optimization of architecture or suitable storage of produced energy, microbial fuel cells are able to power a wide range of widely used devices: for example, store the energy in an external storage device (e.g. capacitor) and dispense that energy intermittently in bursts of high-power when needed [11,12], power sensors for environmental parameters monitoring at various time intervals rather than continuously , provide power for implantable medical devices placed in human large intestine by utilizing intestinal contents , power devices placed on the seafloor or underwater environment . The aims and objectives of this research, therefore, are a determination of microbial population and identification of microorganisms in various depths of the mud sediment, visibility of the sediment to generate power and determination of the pH, organic carbon, conductivity, ionization potential and salinity of the sediments. Rich mud samples were collected at river bark of River Ogbese at various depths (mud surface water, mud surface, depth 50 cm, depth 100 cm, and depth 150 cm) using a soil auger into sterile containers and transported in an ice pack. Microbial population and identification were determined for each sample (mud surface water, mud surface, depth 50 cm, depth 100 cm, and depth 150 cm) and for the control (which was soil sample of the area close to the river). The microorganisms which were mainly bacteria, fungi and yeast were isolated using nutrient agar, cetrimide agar, mannitol salt agar, Salmonella-Shigella Agar, MacConkey Agar, Eosin Methyl Blue, and Potato Dextrose Agar. The physiochemical parameters determined were pH, ionization potential, Salinity, organic and mineral matter. The electrode, cathodic chamber and anodic chamber: Surface sterilized carbon electrodes were used at both the cathode and anode chambers and tightly fixed to a copper wire and submerged into each chamber. The cathode and the anode chamber of the Microbial fuel chamber were 1.5 liters plastic bottles which were cleaned with70% ethanol for surface sterilization before use. Salt bridge: The PVC pipe used in salt bridge construction had dimensions of 5 cm length and 2 cm diameter, the salt bridge solution was prepared by dissolving 3% agar in 1M NaCl. The solution was first subjected to heat for blending, which in return gave a clear solution of agarose and NaCl which was poured into the PVC pipe which was properly sealed and was kept at 25°C for 2 hrs for solidification. Circuit assembly: The circuit’s assembly was done. The substrate (mud sediment), was put in the anode chamber maintained in anaerobic conditions, in the cathode chamber, the aerobic condition was maintained containing the salt solution. Each of the cathode and anode chambers was connected together by the salt bridge sealed with epoxy gum. The Cathode chambers were filled 1 L of NaCl solution and the anode with 1 L solution of the mud sediment each for the various depths (mud surface water, mud surface, depth 50 cm, depth 100 cm and depth 150 cm) which makes up of six MFC chambers. Each chamber was internally connected by a salt bridge and externally the circuit was connected with wires which were joined to the two electrodes at its two ends and to the multimeter by another two ends. The voltage, current, and resistance generated by the Fuel Cell were measured by using a multimeter (Figures 1 and 2). Figure 1. Diagram of MFC system setup. Figure 2. Double chamber MFC setup. The bacterial and fungal population of the mud sediment of River Ogbese at varies depth are presented in Figures 3 and 4. It was observed that bacterial population ranged from 0.04 10-5 to 2.3 10-5 (cfu/ml) and the fungal population ranged from 0.2 10-5 to 0.7 10-5 (sfu/ml). Depth 100 cm and 150 cm has the lowest bacterial count of 0.04 10-5 (cfu/ml) while mud surface has the highest count of 2.3 10-5 (Figure 3). No growth was at Depth 100 cm and 150 cm for the fungal population while highest fungi count of 0.7 10-5(sfu/ml) was observed for the control (Figure 4). Figure 3. Bacterial population of Mud sediment of River Ogbese at varies depth. OGC-Ogbese control, OGS-Ogbese mud surface, OGW- Ogbese surface water, OG50-Ogbese 50 cm depth, OG100-Ogbese 100 cm depth, OG150-Ogbese 150 cm depth. Figure 4. The fungal population of mud sediment of River Ogbese at varies depth. OGC-Ogbese control, OGS-Ogbese mud surface, OGW-Ogbese surface water, OG50-Ogbese 50 cm depth, OG100-Ogbese 100 cm depth, OG150-Ogbese 150 cm depth. Microorganisms isolated from mud sediment are presented in Table 1, nineteen microorganisms were Isolated at the various depth of the mud sediment and the control. The current, voltage, power, current density, and resistance generated form River Ogbese at various depths for 12 days is presented (Figures 5-8). The current, voltage, power and current densities readings were observed to be high between 2th to 10 th day of the experiment and the 11 to 12 day has the lowest readings. The observed readings ranged from 0.02 to 2.17 (mA), 27 to 800 (V), 0.0 to 0.24 (W), 18 to 4357 (Amps/m2) and 0.097 to 9.76 (Ohms) respectively for current, voltage, power, current densities readings and resistance. Table 1. Microorganisms isolated from mud sediment of River Ogbese. Figure 5. Current generated from River Ogbese at various depths. Figure 6. Voltage generated from River Ogbese at various depths. Figure 7. Power generated from River Ogbese at various depths. Figure 8. Current density generated from River Ogbese at various depths. The highest current of 2.17 (mA) was observed at the readings of the surface water on the 3rd day and 1.7 (mA) on the 1st day. The lowest current was observed all through the experiment at depth 0 cm, depth 50 cm, and depth 150 cm. Highest voltage readings of 800 V on the 5th was obtained at Surface water and depth 100 cm with readings of 760 V on the 10th day, depth 0 cm has the lowest readings of 27 V on the 11th day. Highest power and current densities readings of 0.24 (W) and 4357 (Amps/m2) were obtained at the surface water on the 7th day followed by 0.097 (W) and 1563 (Amps/m2) in depth 150 cm on the 3rd of the current generation. Depth 0 cm, depth 50 cm, and depth 100 cm recorded the lowest power and current density readings all through the experiment (Figures 5-8). Depth 0 cm and depth 100 cm recorded the highest resistance of 9.76 and 9.34 Ω at the 6th and 7th day respectively while low resistance was observed in the surface water, depth 50 cm and depth 150 cm (Figure 9). Figure 9. Resistance generated from River Ogbese at various depths. Physiological analyses reveal that the various depths of the mud sediments have low pH, low organic carbon, low ionization potential, high conductivity and high salinity (Figure 10). pH ranged from 4.72 to 7.52, the conductivity ranged from 56 to 344 (μS), the ionization potential of the sediments ranged from 46 to 4 (Mev), salinity ranged from 218 to 15 (ppm) and the organic carbon ranged from 3.12 to 1.08 (%). Depth 0 cm has the highest conductivity of 344 (μS) and the lowest 66 (μS) at depth 150 cm. Depth 50 cm has the highest ionization potential of 46 (Mev) and the surface water has the lowest of 4 (Mev). Depth 0cm has the highest salinity of 218 (ppm) and surface water has the lowest of 15 (ppm). Figure 10. The pH, Conductivity, Ionisation potential, Salinity and Organic carbon of River Ogbese at various depths. PH-PH, CON-Conductivity, ION-Ionisation potential, SA-Salinity and OC-Organic carbon. The upper depth of River Ogbese is probably rich in organic matter than the lower depths which might have contributed to high microbial population observed at the upper depth of River Ogbese and the low population at lower depths (Figures 3 and 4). Higher current, voltage, power and current density were observed generally between 2nd days to the 8th day of electric current generally which is an indication the microorganisms in the mud sediment were in their exponential phase of growth (Figures 5-8). Surface water recorded the highest current, voltage, power and current density, which might be attributed to it having high bacteria and fungi population than other depths . The resistance readings of the various depths were quite high which might have led to the low current and voltage generated because according to Ohms law when the resistance increases the current decreases. The energy used to produce the electron was still also relatively low because most of the energy is used for cell growth. This is evidenced by Park  which showed that bacterial cells in the resting phase can generate more electrons compared to growing bacteria. The pH of the various samples is between slightly acidic to neutral which are good pH for bacteria to thrive, the presence of organic carbon present in the sediment is an indication of it having organic matter. Conductivity and the ionization potential of the sediment is also an indiction of the sediments ability to generate current and voltage. Grubb M, et al. The kyoto protocol, a guide and assessment. Royal Inst Int affairs, London, UK. 1999. Moqsud MA, et al. Microbial fuel cell (MFC) for bioelectricity generation from organic wastes. Waste Manage. 2013;33:2465-2469. Rabaey K, et al. Microbial fuel cells: novel biotechnology for energy generation. Trends Biotechnol. 2005;23:291-298. Angenent LT, et al.Production of bioenergy and biochemicals from industrial and agricultural wastewater. Trends Biotechnol. 2004;22:477-485. Bond DR, et al.Electricity production by Geobacter sulfurreducens attached to electrodes. Appl Environ Microbiol. 2003;69:1548-1555. Cercado-Quezada B, et al. Testing various food-industry wastes for electricity production in microbial fuel cell. Bioresour Technol. 2010;101:2748-2754. Mansoorian HJ, et al. Bioelectricity generation using two chamber microbial fuel cell treating wastewater from food processing. Enzyme Microb Technol. 2013;52:352-357. Logan BE. Microbial fuel cells. John Wiley and Sons. 2008. Liu L, et al. Double-chamber microbial fuel cells started up under room and low temperatures. Int J Hydrog Energy. 2013;38:15574-15579. Du Z, et al. A state of the art review on microbial fuel cells: A promising technology for wastewater treatment and bioenergy. Biotechnol Adv. 2007;25:464-482. Foley M, et al. Life cycle assessment of high-rate anaerobic treatment, microbial fuel cells, and microbial electrolysis cells. Environ Sci Technol. 2010;4:3629-3637. Gil GC, et al. Operational parameters affecting the performance of a mediator-less microbial fuel cell. Biosens Bioelectron. 2003;18:327-334. Gorby YA. Composition, reactivity, and regulation of extracellular metal-reducing structures (nanowires) produced by dissimilatory metal reducing bacteria. Presented at DOE/NABIR meeting, Warrenton, VA. 2005. Gorby YA, et al. Electrically conductive bacterial nanowires produced by Shewanella oneidensis strain MR-1 and other microorganisms. Proc Natl Acad Sci. 2006;10:11358-11363. Logan BE. Exoelectrogenic bacteria that power microbial fuel cells. Nat Rev Microbiol. 2009;7:375-381. Park D, et al. Electricity generation in microbial fuel cells using neutral red as an electronophore. App Environ Microbiol. 2000;66:1292.